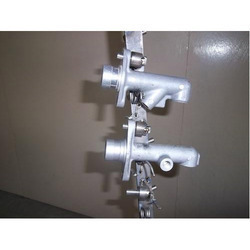 Our range of products include titanium anodising jigs, anodising jig, anodizing jig for spray caps, anodizing jigs, anodizing jigs for aerospace components and custom made titanium jigs. Titanium anodising jigs offered with 4 way clamping for manually operated plants. This design is aimed to house more number of components so that the productivity is taken care. Uniforce is a Leading manufacturers of Titanium Anodising Jigs, Racking systems, Baskets, Heaters, Cooling Coils and many other products for the Anodising & Electroplating industry which is generally called Metal Finishing Industries. We supply bespoke jigging and racking solutions to Anodizers, Electroplaters, Metal treatment specialists who are supplying precision components to Major Aerospace and Automobile companies. Our company’s main priority is to provide a fast and efficient service, supplying excellent quality products and solutions which fulfil our clients needs. 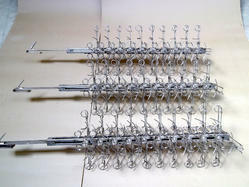 Titanium jig made out of Gr.2 titanium wires for anodising of spray caps . 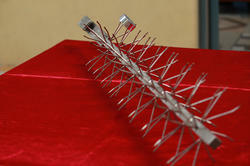 Inspired by Umbrella these jigs designed to house a good volume of components at single stroke. We are specialised in custom designed titanium anodising jigs for specific requirements. We have undertaken supply of titanium jigs for most complicated profiles for their optimum production volume. 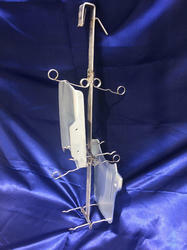 We supply jigs for both manual and Automatic plants. Quality is always at the top of the agenda with aero space component and product manufacturers alike, and for processes involving surface finishing, the need for properly and correctly designed jigs is vital. Uniforce focus on manufacture and supply of cost effective and most suitable designs for optimum productivity of individual components. Titanium anodising jigs bespoke to suit individual customer requirements. 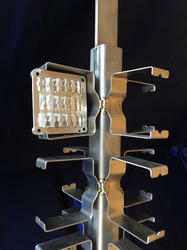 Custom made Titanium anodizing jig designed for aerospace industries. Maximum holding stations for productivity. TIG welded clamps for better conductivity. Uniforce has manufactured and supplied huge volume of Customised Titanium Anodising Jigs to leading Auto components and Aerospace components suppliers across nation. The answers are simple: 1. Aluminum racks are consumable. Anodic film builds up, necessitating stripping. 2. Titanium racks are consistent from run to run. 3. Titanium racks don’t anodize as do aluminum racks. 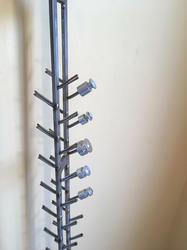 Therefore, you can use your rectifier to anodize parts, not racks. 4. The higher initial cost of titanium racks is more than offset by the in-process savings, better consistency and longer life advantages of titanium. 5. Above all, our titanium racks carry Uniforce quality and thought-through engineering into your tanks. 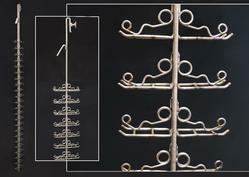 The value of having our racks on the job will be realized again and again, in your anodizing. From our customer service and sales people to engineering, plant operations and shipping personnel, Uniforce speaks volumes about doing a job the right way, every time, to the customer’s continued satisfaction. That’s why, for your anodizing operation to be its best, talk to Uniforce. Uniforce is a leading manufacturers of Titanium jigs, Titanium racks, Titanium anode baskets, Titanium heaters, Titanium coils and many other products for the anodising & electroplating industry. Our company’s main priority is to provide a fast and efficient service, supplying excellent quality products and solutions which fulfill our clients needs. Utilizing our expertise in both metal finishing technologies and titanium fabrication, we work with a range of jig designs in titanium. 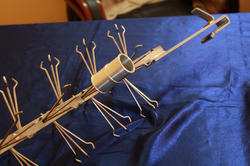 Uniforce undertakes design, development and prototype model jigs. Our Engineers assist you in process evaluation of developed jigs, Repair /reconditioning/ refurbishment of our supplies. 1. Aluminum jigs are consumable. Anodic film builds up, necessitating stripping. 2. Titanium jigs are consistent from run to run. 3. 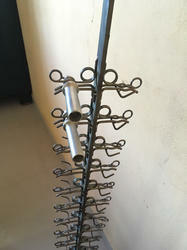 Titanium jigs don't anodize as do aluminum racks. 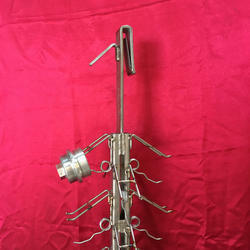 Therefore, you can use your rectifier to anodize parts, not racks. 4. The higher initial cost of titanium jigs is more than offset by the in-process savings, better consistency and longer life advantages of titanium. 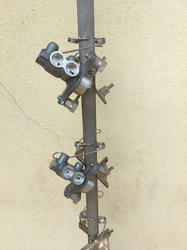 Design manufacture and supply Titanium Jigs and Fixtures is one of Uniforce Engieers key product line. Uniforce has a huge Corporate clientele base use their Titanium Jigs and Fixtures which are custom designed for specific requirements. 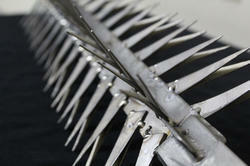 Most of the ingenious designs in common use today with surface treatment sector are created by UNIFORCE. We are entrusted with all kinds of jigging problems. Many leading names from a wide range of industries including aircraft, Automobile, electronics, engineering and domestic appliances use UNIFORCE jigs as do many large and small platers throughout the country. Our Titanium anodising jigs have proved extremely reliable and very popular, comprise standard items which are uncomplicated and yet very effective. We are always happy to develop these designs and others, quickly and efficiently to suit individual requirements where necessary. Titanum anodising jigs designed for large size components to be anodised in a manual plant. We offer Optimum design for good quality treatment, easy and maximum loading. By keeping track of the ongoing market developments, we are engaged in offering an outstanding quality Titanium Jigs for Aluminum Anodising to the customers. The offered products are precisely designed and manufactured in line to industry quality standards by utilizing premium quality raw material and cutting-edge technology under the guidance of skilled and experienced quality controllers. Moreover, we are offering this product in standard as well as in customized forrequirement of our prestigious clients at market leading prices. One of the very unique design by us. 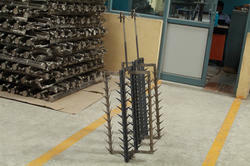 Supplied for a mass production of tubular rivets. 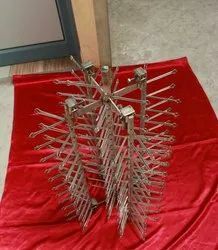 Single jig can hold 1000 rivets at a time. 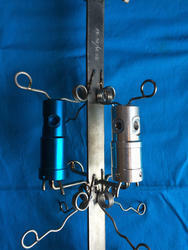 Uniforce has beening offering customised Titanium Anodising jigs and Fixtures for most complicated parts. Titanium is far less conductive material than aluminium and hence accurate design is required for ensuing uniform current flow so that the qualty of anodising is not compromised. 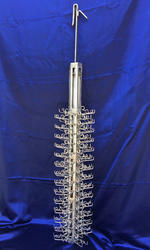 Today Uniforce is very popular among major anodising units for Customised design of Anodising Jigs. Titanium Jigs and Hangers made for processing aerospace components are developed as per component drawings provided by the customers. Uniforce designs all these kind of jigs producing proto type sample components at their end. All our jigs are designed for maximum productivity with almost zero rejection rate. 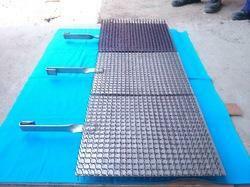 Titanium Anodising Fixtures for Auto Anodsing line is one of Uniforce's key product range. UNIFORCE is a proud supplier of customised anodising jigs for Special Processing Companies which comply with NADCAP approval. We customise and supply a wide range of titanium jigs/hangers for anodising & hard anodising. We supply most versatile designs of Titanium Jigs for Auto component manufacturers, Aircraft parts manufacturers and medical implants manufacturers. Fishbone jigs made out of titanium are used for anodising complex shapes and sizes. Unifroce offers "Titanium Fishbone Jigs" of various sizes with varying number of sprungs sapced as to suit customer requirement. Fishbone frame jigs are designed for production volume for small components. 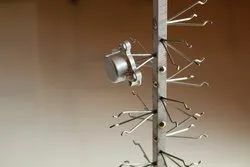 Titanium conducts the electricity to the part which is necessary but the titanium does not anodize, like an aluminum rack would, and thus you don't have to strip it in between uses ... it lasts forever. Our jigs are made from commercially pure grade titanium material suitable for anodising process. Unifiorce supply widest range of jigs that are custom built to find application in Automotive, Aerospace and medical field which demand stringent surface treament norms. 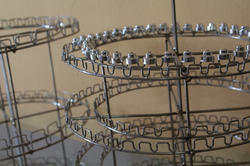 Titanium Fishbone Hangers are customised for huge volume of small components to be processed for aerospace Industries. Titanium Fishbone frames with additional attachment for a range of components are designed and supplied according to customer request. Titanium Hybrid Jigs are made of dual Material of Construction ie., Titanium Spine with Copper Hooks for better conductivity and more ampereage required per piece. This versatile design ensure uniform distribution of current for employing more number of components per jig. Uniforce design,manufacture and supply both Inbound and outbound prong jigs according to the prorcess demans and configuration of the components. Titanium Prong Jigs with attachment arms for anodising more quantities. 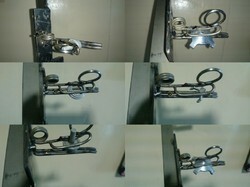 These jigs are designed for effective utilisation of window space available in the anodising tank. As loading is done parallely on parent jig and attachment arms, it saves a considerable amount of time.